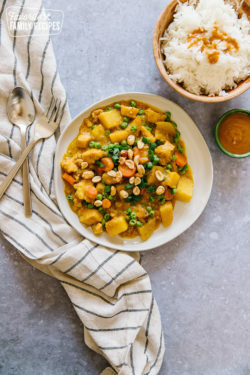 Coconut Curry Chicken is chock full of sweet, slightly spicy flavors and is the perfect warm, comforting meal for any night of the week. There's something for everyone to love with this tasty dish! 1/4 cup peanut sauce "House of Tsang"
Heat chili oil in a large skillet over medium heat. When oil is hot, add onion, garlic and ginger. Saute for about 45 seconds. Add chicken broth, cumin, turmeric, paprika, curry, and salt and pepper. Simmer for a few minutes, then stir in coconut milk. Bring to a boil, then reduce to a simmer for about 30 minutes. While curry sauce is simmering, cut the chicken into small pieces and coat with cornstarch. In a medium skillet, heat oil and saute chicken until cooked through. When fully cooked, remove and drain on paper towels. 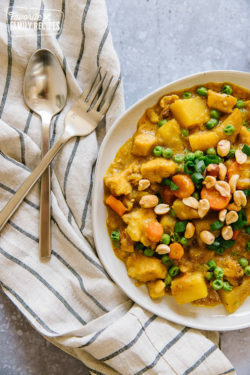 When curry sauce has finished simmering, add carrots, potato, peas and cooked chicken. Simmer for another 10-15 minutes, until veggies become tender. When serving, plate the rice and drizzle some of the peanut sauce over the top. Serve curry sauce around the rice or to the side. Garnish with peanuts and green onion. Follow the instructions for preparing the curry up to the point of stirring in the coconut milk and bringing the curry to a boil. Instead of simmering for 30 minutes, add the curry to the crock pot, cover and set heat to high. Prepare the chicken as per instructions above and add to crock pot. Add potatoes and carrots to the crock pot and continue to cook on high for 2-3 hours. The vegetable should be al dente at 2 hours. At 3 hours the vegetables will be cooked soft. 15 minutes prior to serving, stir in the frozen peas.